Mary Shelley’s 1818 novel Frankenstein is often seen as a commentary on modern fears that humanity’s pursuit for scientific knowledge and truth can often cross "sacred" moral and ethical boundaries. As is often the case with cautionary tales, it can sometimes feel like they’re taken as a guidebook. In a Halloween homage, here’s a roundup of experiments that have toyed with life and death – experiments that would make Dr Frankstein himself shudder. Although grossly unethical by today’s standards, many of these experiments have braved new waters in the field of biomedical research. In other cases, they’re just plain crazy. In 1929, a time long before PETA, Ernest Glen Wever and Charles W Bray managed to turn a live cat into a walkie-talkie. After removing a chunk of the cat’s skull, they attached one electrode to the animal’s right auditory nerve and another to its body. These were attached by an 18-meter (60-foot) cable to an amplifier in a soundproof room. When one of the researchers talked into the ear of the cat, the sound could be heard in the receiver. They then killed the cat and tried it again, and that’s how science learned dead cats can’t be telephones but alive ones can. Born in 1918, just after the Russian Revolution, Vladimir Demikhov was a Soviet scientist who experimented with transplants on animals from the 1930s until the 1960s. Although he is now regarded as somewhat of a pioneer, his grisly experiments on dogs have left a stain on his reputation. Most notable were his attempts to graft two dogs together. His operation sewed the forearms and head of small 9-year-old dog named Shavka to a larger stray dog called Brodyaga, which translates to “Tramp”. The operation involved severing the jugular vein, the aorta, and spinal column of Shavka, then linking her circulatory system to Brodyaga's body. The two heads could eat and drink separately, although both canines died four days later. Nonetheless, Demikhov attempted this experiment dozens and dozens of times on different subjects. 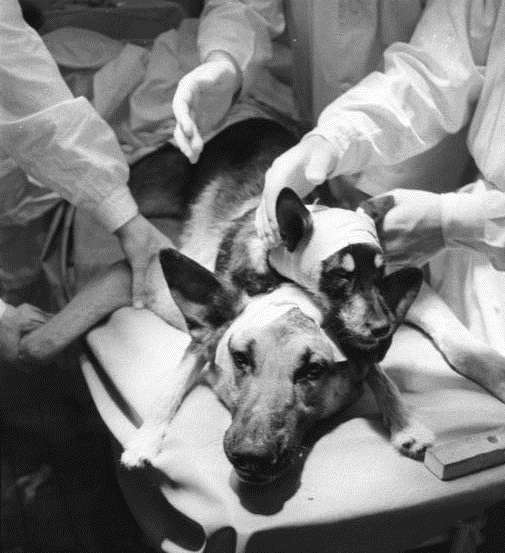 Reporting on this story in 1959 with a fair dose of skepticism and fear, Life Magazine said: “The Russians who created the two-head dog are now considering a human transplant: putting a new leg on a woman who lost her own.” It isn't believed this operation went ahead. However, in his time, Demikhov did also carry out transplants. The history of surgery, however, isn't all tarnished with “mad scientist” smirch. During and after World War One, at least 3,000 soldiers underwent surgery at The Queen's Hospital for the wartime wounds they sustained from shrapnel. Although visually shocking, these operations were truly remarkable for their time. The work of Dr Harold Gillies is the best documented of these. His book Plastic Surgery of the Face is available online as a free eBook on archive.org. One of his most impressive feats was the surgery on Lieutenant William Spreckley (seen above), who sustained massive damage to his nose and cheeks after a gunshot to the face in January 1971. Dr Gillies took rib cartilage from the patient and implanted it into Lieutenant Spreckley's forehead. It stayed there for six months, and in a subsequent operation it was then transferred and used to construct a new nose. After three years of work, Spreckley was discharged in October 1920, looking absolutely remarkable. It’s no surprise that Dr Gillies is often hailed as the godfather of modern plastic surgery. All manner of plants and animals have been genetically mutated to glow in the dark, from chickens and tobacco plants to, of course, rats. But perhaps weirdest of all are the glow-in-the dark pigs. In 2006, scientists from National Taiwan University's Department of Animal Science and Technology added genetic information from jellyfish into pig embryos. The result was three pigs that glowed in the dark with a fluorescent green light. Even stranger, the scientists say the pigs' organs glowed. This is not the first time pigs have been made to glow odd colors, however, the Taiwan scientists were particularly proud of their achievement, saying theirs were the best glow in the dark pigs ever produced. The scientists behind these transgenic pigs stressed that the study could be used to further stem cell research and to investigate human diseases, according to ABC News. Needless to say, most people were just freaked out by it all. The Vacanti Mouse was a lab mouse that was part of a study in 1997, in which the rodent had what looked like a human ear grown on its back. 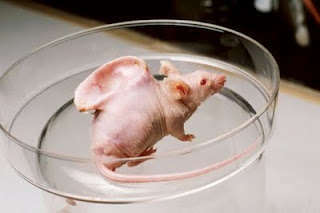 The ear on the mouse was actually made of a biodegradable polymer frame, based on that of a 3-year-old child. Once under the skin of the mouse, cartilage was able to grow into the shape of an ear using chondrocytes – cartilage cells from a cow. It was a meant as a demonstration of how to grow tissue-engineered cartilage. However, it became a meme in an era before memes, by circulating through chain emails and water-cooler conversations with people held in disbelief. A similarly strange experiment has since been conducted in a 2013 study. Science and morals have always had a checkered past. The issue is made even more difficult when you consider that many of these morally dubious moves have actually helped progress our knowledge of medicine, biology, psychology, and genetics. It seems that when science is trying to push our understanding of the natural world, it can equally test our moral understanding. Even now, in a time when heart transplants are not viewed with skepticism, certain types of experiments can still challenge our minds and grab headlines. For example, Italian neurosurgeon Professor Sergio Canavero's current plans to conduct the world's first head transplant has labeled him in the media as a “Dr Frankenstein”.